Do all your gardening from the garden path. 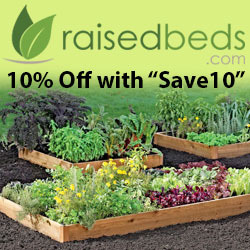 Raised beds produce more per square feet than ordinary beds. You can have a big garden in a small space. 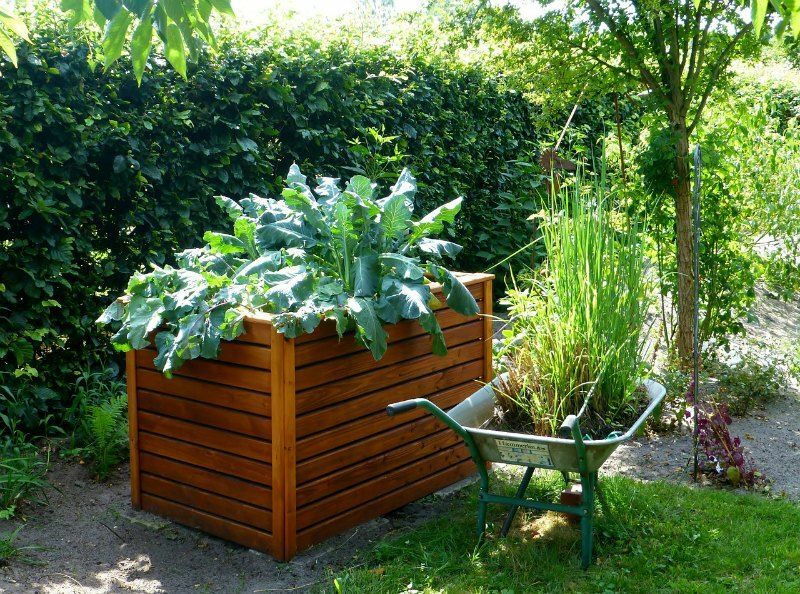 Raised garden beds are perfect for backyard container vegetable gardening. 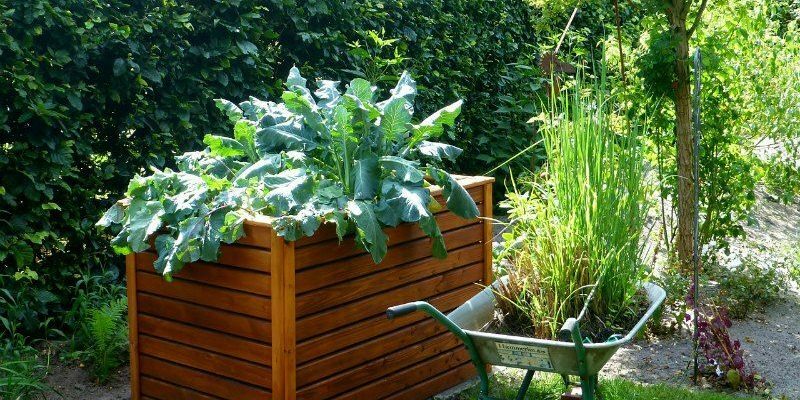 Raised garden beds can extend your gardening season. They tend to warm up a little sooner in the spring. They remain productive later in the fall. The warmth and charm of cedar boards and corner posts are much more appealing than plastic forms or landscape blocks. 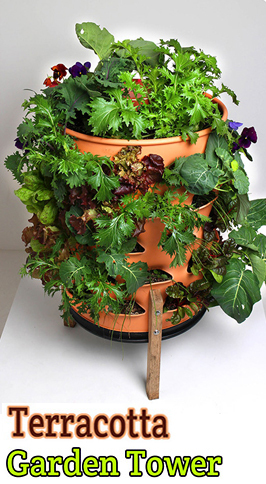 Here are some beautiful container vegetable gardening ideas. Red cedar is naturally resistant to rot and insects, and you’ll have no concerns about chemicals that may leach out of treated wood or railroad ties. Cedar raised garden beds are so strong that you can put them together and then carry them out and set them in place in your garden. Here are 16 container gardening ideas and layouts for a beautiful and productive raised bed garden. 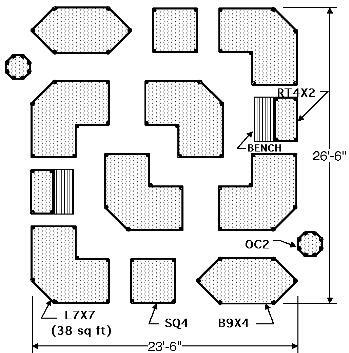 Here’s a compact garden plan that’s more interesting than a couple of plain rectangular boxes. 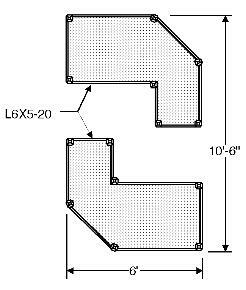 The “L” shapes feature large and small bed spaces while the combination creates a charming zigzag in the garden path. Total Bed Space = 40 sq. ft.
Here’s a stretched version of garden #1. 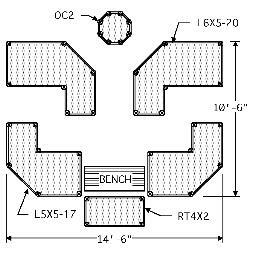 The addition of a 2 ft. octagon provides a prominent location to show off your special plants and creates space for a bench alcove. An optional terrace has been added to the “L” behind the bench to make the alcove extra cozy. Total Bed Space = 44 sq. 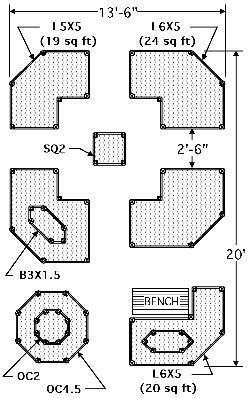 ft.
Here’s a raised bed plan that can convert that unused corner of your yard into a delightful garden. Total Bed Space = 46 sq. ft. This is the elegant “show off” of the compact raised gardens. The large “boat” shaped raised beds with their optional terraces can be planted with extravagant blooms and cascading colors. 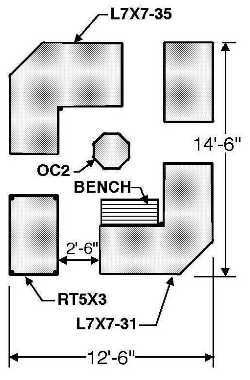 Total Bed Space = 36 sq. ft.
Here’s a simple but elegant container garden that is very affordable and has 60 sq. 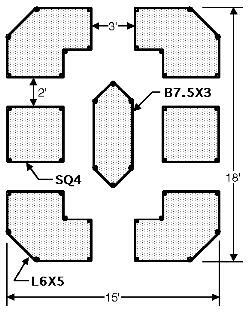 ft. of bed space in a square layout that is only 10-1/2 ft. on a side. Total Bed Space = 60 sq. ft. This is a beautiful raised bed garden that features a delightfully meandering garden path and a regal center walk from the prominent entrance bed to a cozy bench alcove. 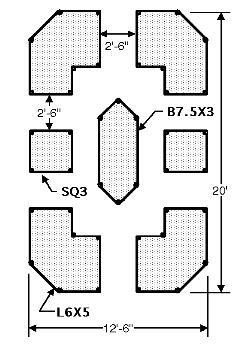 Total Bed Space = 86 sq. ft.
Here’s the classic garden design. It has lots of bed area for veggies, an elegant garden path that loves to be bordered with color and a central focal point for special blooms and herbs. Total Bed Space = 90 sq. ft. There are some container gardens where you can create several size variations. Total Bed Space = 80 sq. ft.
Total Bed Space = 105 sq. ft. 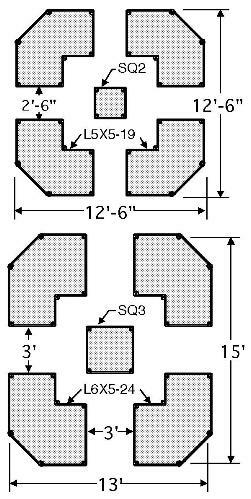 If you want a container garden that is user-friendly or you just want extra deep beds, this variation has all 22 inch high beds. The layout shown features extra wide garden paths to provide lots of access for disabled gardening. Total Bed Space = 93 sq. ft.
Here’s a very affordable raised garden that boasts 92 sq.ft. of bed area. It has an interesting garden path that has delightful bends and branches. Total Bed Space = 92 sq. ft. This container garden design has an octagon at its center for special blooms and space for a bench so you can sit and read a book and enjoy your garden. Total Bed Space = 100 sq. ft. This is an elegant large garden with some interesting spaces. The large octagon and the bench alcove add a special grace to this garden. 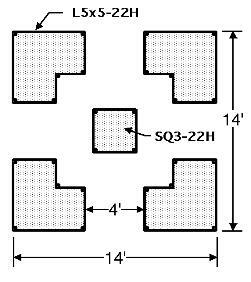 Total Bed Space = 131 sq. 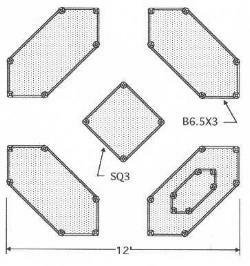 ft.
Another popular raised bed garden style is a rectangular layout with a “boat shape” bed at the center. 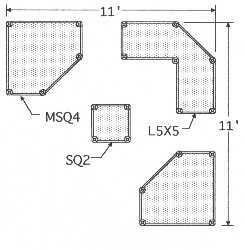 with 4 ft. squares and adjust the spacing and you have a variation of the Dartmoor that fits a slightly shorter and wider space and has 14 sq. ft. more bed area. Total Bed Space = 145 sq. ft. 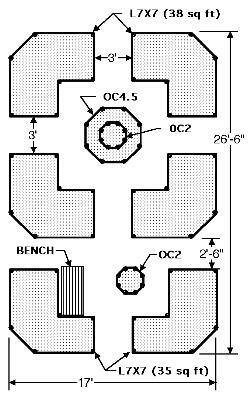 This container garden design has all 22 inch high beds. The layout shown features extra wide garden paths to provide lots of access for easy gardening. Total Bed Space = 120 sq. ft. This regal container garden features a terraced octagon as the focal point and an elegant bench alcove where you can relax and enjoy the splendor of your garden. 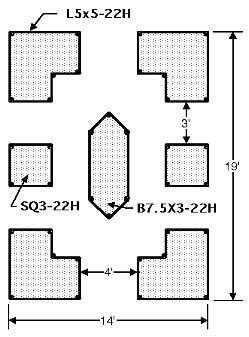 The space occupied by the large octagon would also make a wonderful spot for a water garden, a fountain, or growing savory container garden herbs. 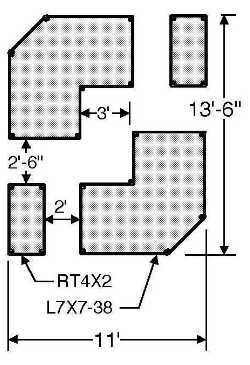 Total Bed Space = 242 sq. ft. This container garden features 340 sq. 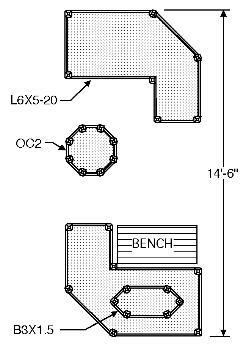 ft. of bed area, enough garden paths to get lost in and two bench alcoves (substitute a 4 ft. square to eliminate a bench alcove). 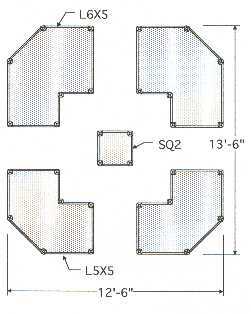 Total Bed Space = 340 sq. ft.